Whole Foods Market tour, where you will learn how to shop for weight loss & optimum health. Understand which foods and grocery products are best, when on a weight loss diet. This is episode 2 in a 5 part video series, created by Max's Best Bootcamp & Whole Foods Market. This episode focuses on the best protein sources, in the Danbury CT store. Sources of protein like meat, chicken & fish can all work well for losing weight, but there are advantages & disadvantages to some proteins over others. We break it down for you! When you start with a high quality piece of fish (or any other whole food) you don't need to do much to it, for it to taste amazing. While some fish, like salmon, is higher in calories that tilapia, they're both great protein sources for weight loss & optimum health. One serving per meal is ideal, which is about the size of your smart phone. 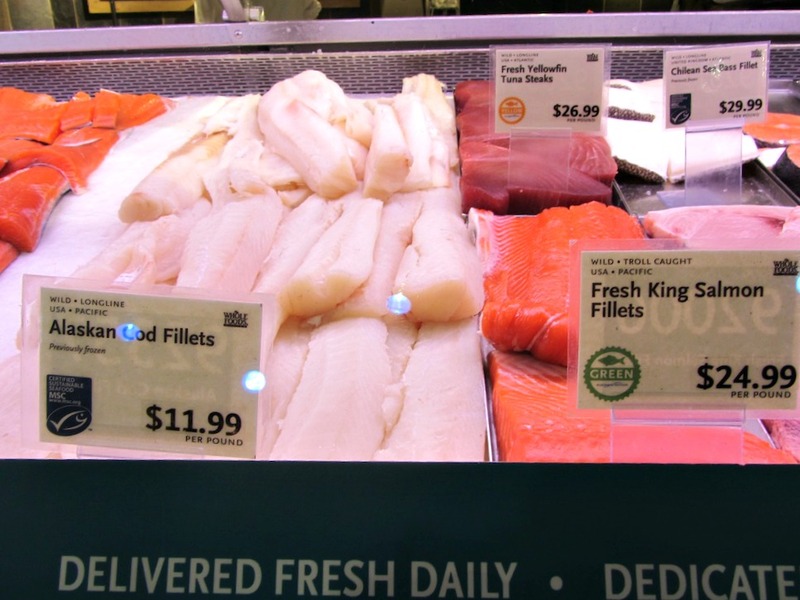 Before you plan which one you buy, be sure to ask your fish monger what's fresh that day! He or she will be proud to tell you what's freshest & also share with you exact tips on how to cook them, too. If you haven't had a nice steak in a while, you may want to reconsider. Many of our new clients say that they've stopped eating red meat, because "it's bad." Well, that's been debunked. If the animal is healthy, then they're healthy to consume. Conventional meat (of all varieties) is an unhealthy animal, so we don't recommend supporting it. Instead, look for local, pasture raised & grass-fed beef. They're beautifully healthy animals, that eat only grass their whole life & are never pumped with antibiotics or hormones. Local is always best, too! But isn't red meat high in calories? Relative to chicken breast, yes. In general, beef is about 50-60 calories per ounce VS. chicken breast which is about 40 calories per ounce. So, as long as you potion your servings properly, it's all good! Plus, there's a thermogenic effect when you consume protein...meaning your body will rev up to burn calories, just to consume it. This is less true with carbohydrates & fats. I usually get the grass-fed ground beef here. Would you want me to make a post on how I meal prep protein? We hope you found these weight loss tips helpful! What other questions do you have about protein sources? If you're serious about finally losing weight & getting your health back, check out our customized meal plans today. Many people think they can out train a bad diet. That won't work. We will create a meal plan that super simple, will get you instant results, and will allow you to keep the weight off for good! Used best in conjunction with a proper fitness program. Come try a complimentary workout with us, if you're in the Danbury CT area. Whole Foods Market tour, discussing how to shop for weight loss & optimum health. Learn exactly which foods and grocery products are best when on a weight loss diet. This is episode 1 in a 5 part video series, created by Max's Best Bootcamp & Whole Foods Market. This episode focuses on healthy carbohydrates, in the Danbury CT store. Grains, fruit, and vegetables can all work well for losing weight, but there are advantages & disadvantages to some over others. We break it down for you! People often ask if bananas make you fat. Let's be real...no one ever got fat from eating fruit! Too many calories make us fat, especially when they're highly processed foods. Eating clean will allow your body to feel great & perform at it's best. Not only that, your will increase your body's ability to burn fat! So opt for the banana over the chips any day of the week, ok?! 1-2 servings of fruit per meal or snack is ideal. So 10 bananas is not a great idea...but still better than the whole bag of chips/fries/oreos (insert favorite sweet/salty treat here). Berries are best for weight loss & fat loss, because they're higher & lower in sugar than most other fruits. Apples & pears are also a solid pick. Are grains bad? Are some "better" than others? They're more or less the same, when it comes to their carbohydrate load on the body. It's dose dependent. Meaning, how much you eat at one time, determines how they will affect your blood sugars. When we eat any carbs, it will cause an insulin response. That means sugar, brown rice, oatmeal, quinoa, honey. That's why we always recommend a no added sugar, low starch diet. It's naturally anti-inflammatory & will allow your body to burn fat as fuel, vs having to burn the sugar out of the system first. Also, consuming too many carbohydrates leads to insulin spikes, fat storage, diabetes, increases cardiovascular risks as well. If you really want to have grains, then you may have a serving at a time. But, you don't need them & you'd be better off getting your healthy carbohydrates from fruits, yogurt, and veggies. what to eat instead of grains? We hope you found these weight loss tips helpful! What other questions do you have about carbohydrates? If you're serious about finally losing weight & getting your health back, check out our custom meal plans today! Many people think they can out train a bad diet. That won't work. We will create a meal plan that super simple, will get you instant results, and will allow you to keep the weight off for good! Used best in conjunction with a proper fitness program. Come try a complimentary workout with us, if you're in the Danbury CT area.